How Can So Many Scientists Be So Wrong About The Pause? Using simple statistics it looked at and dismissed over 200 peer-reviewed papers that analysed the pause and concluded it was a real phenomenon. How did they, and the IPCC, get it all so wrong? Nobody who keeps an eye on climate research will be at all surprised by this “new” paper. Its conclusions were well aired in April 2018 at a meeting of the European Geophysical Union. The authors must have been rather frustrated at the time as the paper describing their work had been submitted to the journal Environmental Research Letters over a year earlier, in February 2017 in fact, still had not been published. This was remedied a few days ago when it was finally published — one year and nine months after its submission! The tone of this paper is established at the start with a quote about the polywater affair. This was a hypothesized polymerized form of water that was the subject of controversy during the late 1960s. By 1970 doubts about its authenticity were being raised and by 1973 it was found to be illusory, being just water with contaminants. Is the global warming ‘pause’ (also known as ‘hiatus’ or ‘slowdown’) a modern analogy to polywater pathological science? To prove that the authors will have to come up with much harder facts and better arguments than they do. In fact, their approach is not new and is part of a series of papers by the authors, each reaching the same flawed conclusion. 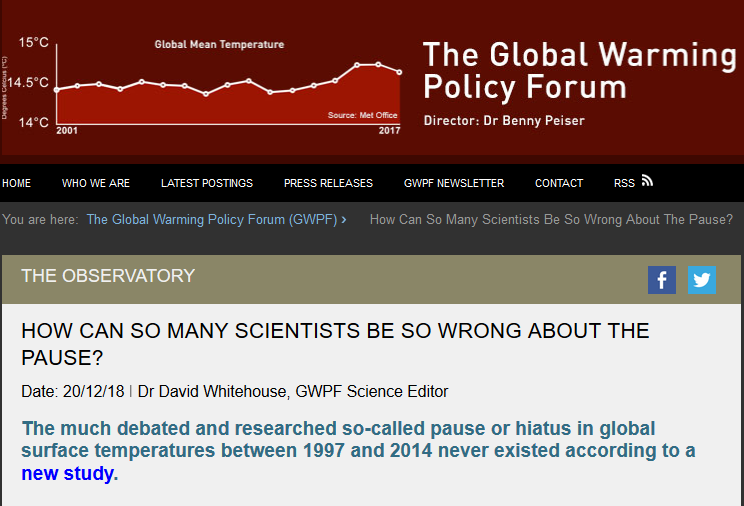 But what is truly staggering about this new paper is just how unscientific it is in dismissing the 200 peer-reviewed papers that confirm the empirical reality of a warming pause or slowdown in the early 21st century. Considering that the paper was only accepted by the journal after one year and a half, it is quite remarkable that so much sloppiness managed to get through peer review. The authors talk of “short-term trends” in global mean surface temperature “over a decade or two.” A 20-year trend, most of a canonical 30-year climate definition period, is certainly not short-term, especially since the recent era of global warming began in 1979. The authors say that 30 years was chosen as it is considered long enough to smooth out decadal-scale changes. It doesn’t if such changes last for 20 years or more. The definition of the pause or hiatus is not straightforward, according to them, and they say “mere description of it is not statistical evidence.” This flies in the face not only of those 200 papers they analyse, but the whole tenet of observational science. It is often said that the most important words in science are “that’s interesting,” when something strange is observed. I am sure that if one looks at the HadCRUT4 data set from 1997 to date and notes the El Ninos and La Ninas most scientists would say there was something there. Statistics show there is. The pause ended due to a severe example of weather not climate, the 2015 super El Nino, after which temperatures are returning to pre-El Nino pause levels. Nowhere in the body of this paper is the El Nino even mentioned! News reports of this dodgy paper show that some commentators and journalists have once again fallen into the “last paper” trap. One just-published paper very seldom destroys a raft of others, especially since the paper was submitted in February 2017 and since then there have been many new papers confirming the existence of a global warming pause. Yet the authors still claim that the IPCC got it wrong and all those 200 peer-reviewed papers are also wrong, all having made elementary statistical errors. Not surprisingly, the authors who have a long history of political activism, accuse climate scientists who have published papers on the pause for contributing to inaction on climate policy and giving succour to contrarians (who, let’s not forget, discovered the existence of the warming trend slowdown in the first place). It is one thing to write a paper that claims that everyone else is wrong; it is entirely different and borders on intimidation to effectively accuse all other scientists of being traitors. When I point out that the authors of the study include Stephan Lewandosky, Kevin Cowtan and Naomi Oreskes, you will realise why the research is worthless.